It seems that flyfishers are constantly engaged in a struggle between our purist roots and technological advancement, and this rings true now more than ever before, as the speed of change continues to accelerate. Both as a guide and flyfishing enthusiast, I am always interested in the latest and greatest new toy, but also understand their adoption often shapes the evolution of the sport and the way we participate in it. So when news of a fully remote operated (FRO) trolling motor started a few years ago, I was instantly caught up in the hype, considering how it might transform my personal fishing in the Indian River near Vero Beach where I am often fishing by myself. The gps tracking features and autopilot would allow me to solo fly fish for snook under the mangroves as never before, while tarpon and redfishing flats and creeks with remote in one hand and rod in the other. I wanted to have the first one off the assembly line…fast forward to now and I am starting to see the proliferation of this new technology reaching out into many other fisheries, coming to the aid of other fisherman and guides, while quietly influencing the behaviors of both fish and fisherman. It would be helpful to consider the introduction of the trolling motor, particularly the FRO trolling motor in the context of other technological innovations. Innovative technology is often discussed in two categories: sustaining and disruptive. Sustaining innovation relies on incremental improvements to already established technology, like the introduction of carbon fiber into the manufacture of push poles. Where as disruptive innovation lacks refinement, often has performance problems because its new, only appeals at first to a limited audience and may not have a totally proven application, which rings pretty true for the FRO trolling motors I witnessed in use this year…both units broke within weeks of being installed, their owners only use their basic deploy, trim, steering features, and most people I spoke with about them baulked at the price. I’m not suggesting that this innovation will have as profound affect on fisherman and their fisheries as the invention of the personal computer, email, and social networking did on society, but I do think we will have trouble trying to put this genie back in the bottle or ignoring its influence on fisheries in the future, like the Florida tarpon fishery. As a fisherman on point, standing atop the casting platform, we do not always appreciate the skill it takes, the effort it requires, and the method in which we are put on fish. There are several options for creating boat position favorable to getting shots at poons. These options include both passive and active methods, or require a combination of both. Free floating, drifting with wind and/or current, deploying a drogue, and waiting on anchor represent the passive approaches, while poling and using a trolling motor fall into the active positioning category. Sometimes we get lucky and the fish swim directly at the boat, but more often than not it requires complex calculations of time, tide, and multitude of other inputs to create and execute a strategic plan. Spotting fish, reading fish behavior, extrapolating or anticipating their future position, and calculating the best achievable boat position in order to create the optimum fly presentation angle all represent inputs that must be processed while moving, or choosing not to move the boat. 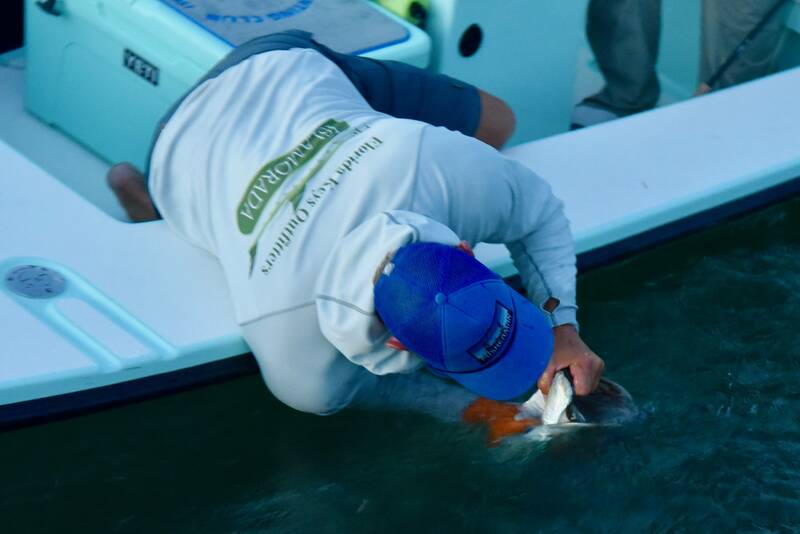 Each method utilized to position the boat comes with certain advantages and limitations for those pursuing tarpon on the fly. These methods also influence fish behavior in unique, subtle, and cumulative ways depending on their overall prevalence of use. The extents to which they are adopted and exploited contribute to how the overall fishery evolves, shaping what becomes accepted practices, determining frequency of conflict, and defining etiquette among other aspects. 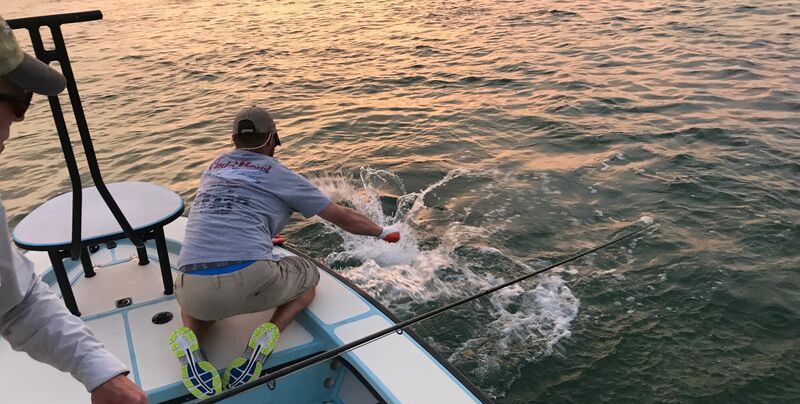 The push pole is the original piece of technology that allowed pursuit of tarpon by boat in shallow water with the necessary stealth and simplicity needed to create great opportunities to hook a silver king. It can double as an anchor in certain situations when the bottom conditions are suitable for staking out, holding position in silence. The pole can be used with a detachable anchor, requiring a person to unclip the anchor rope and throw the buoy over the side, which can be difficult if holding a rod, line, and fly. This system becomes much more effective if there is a third person in the boat. Poling can also move the boat in extreme shallow water and will not be subject to cavitation in waves when the bow bobs up and down with the motor head trimmed up. The push pole can’t run out of battery power, but the human power supply is subject to fatigue and heat exhaustion and has a lower top speed than that of most new 24 volt trolling motors. They don’t break down as such, but can be broken if jammed in coral or stuck in the mud, mishandled in the wind, or damaged by angry sharks, as one of our guides experienced when a shark left three broken teeth imbedded in the shaft of his push pole after he tried to scare it off. It takes time to develop the skill to effectively use a push pole, as I have experienced over the last couple of seasons, necessitating the user to stand atop the poling platform which requires balance, physical dexterity, and exposure to failing off. Competent push polers can deliver it to the bottom with minimal noise and impact, as well as removing it from the water with minimal disturbance of the surface, while those beginners definitely announce their presence bouncing it off the poling platform, striking the bottom, and dropping it with regularity. I think we can all agree that fisherman in the pursuit of tarpon affect fish behavior, whether throwing flys at them off anchor or pushing after them on an intercept course with a 20+ foot long pole, it comes down to the fact that these magnificent fish live a long time and seem to have an explicit memory. While the proper use of a pole greatly affects the amount of influence exerted on fish behavior, other factors such as the level of intensity of pursuit, the overall number and frequency of push poles they encounter in a day also play a role. Electric trolling motors have been around since 1934, but have really proliferated and improved in the last 30 years. The top end electric motors now resemble something out of Star Wars, maybe a cousin of R2D2, complete with an animated rotating head and the signature chirps, beeps and whirs. These small noises ever so slightly intrude on tranquility of the moment, however the use of the motor does create some opportunities, like turning some marginal higher wind conditions into quite fishable ones, so there is a trade off. While trolling motors come in many forms: transom mounted, lower unit mounted, trim tab mounted, it seems to be the remote bow mounted motors seem to be gaining market share due to their functionality. This is evident in the Florida tarpon fishery, which seems to be experiencing a prolific hatch of sorts; these FRO trolling motors seem to be popping up on the front of flats boats in every increasing frequency. After observing a healthy portion of this year’s tarpon fishery around Big Pine Key, I witnessed some interesting situations resulting from fisherman exploring and exploiting their newly found capabilities, observed FRO’s in action first hand while fishing, and heard opinions regarding their affect on fish behavior. If you’re not familiar with the features and abilities of a fully remote operated trolling (FRO), then it would be worth noting that they can self deploy and stow, self trim, hold position within a 1m (virtually anchoring), follow preprogramed tracks, and be steered using a handheld remote. They are very appealing to fishermen wanting to gain a competitive advantage over others, real or perceived. For me the jury is still out as to any advantage for actually catching fish overall, as I have got bit, hooked up, and landed more tarpon without the aid of a trolling motor than with. However, the FRO motors do allow you to do certain things with greater ease, some things that were not before possible, and do not require standing on the poling platform. This season I witnessed people following pods of migrating tarpon for greater lengths of time, more solo tarpon fisherman, and heard terms like “they (tarpon) can feel the motor”, meaning that the fish behavior was being altered at a distance beyond their visual range. All of these have implications for the fishery, but hopefully the following of fish for extended periods with be sorted out through an evolution in acceptable practices and etiquette, the solo fishermen will realize that the traditional team approach and boat comradery out weighs the importance of maximizing the number of shots you can achieve through technology, even so the fish “feeling” the motor may be the most difficult to quantify yet may in the end be self mitigating. Once these giants get conditioned to vibration of these motors it may limit the effectiveness of their use in getting close to happy willing fish. 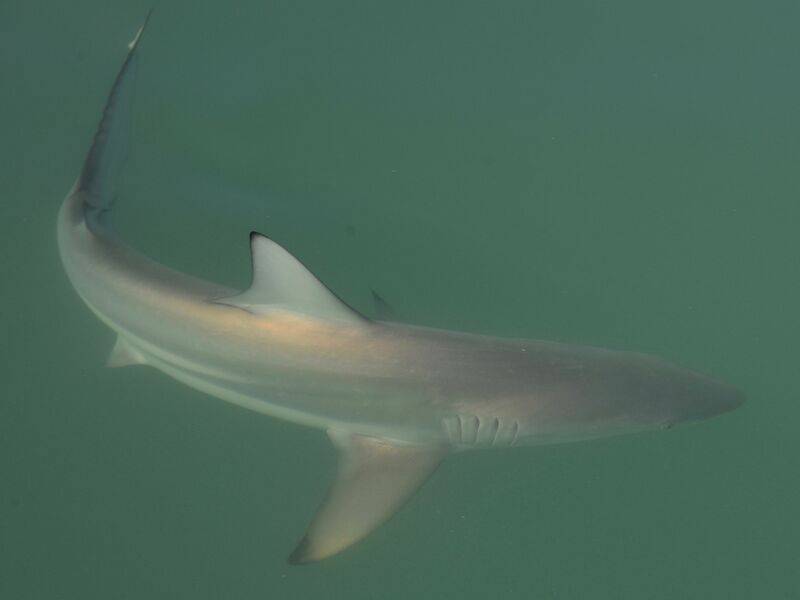 With some of these fish living into their 50’s and 60’s, it seems reasonable to assume they will adjust their behavior given time, a high frequency of encounters, and close exposure proximity. On several occasions over the month, I noticed that the trolling motor provided a higher number of shots per hour, due to the fact that we could move faster between strings and intercept more fish especially on windy days, however this increase in opportunities did not always translate to more bites per hour, so it is difficult to say if we were fishing more effectively or just staying more entertained. Ultimately it seemed that it mattered more about how far off we were able to see the fish and set up with a good angle than what method we used to access them. Overall, I felt the trolling motor did create some opportunities that may have not been possible otherwise, which included keeping the guide fresh on some really hot/humid days allowing us to fish longer, moving quickly up wind over longer distances, as well as holding position in a moments notice will waiting on fish. While fishing an FRO trolling for a few days, we forgot to charge the batteries one night making us run out of battery power half way through our fishing day…luckily we had a push pole with us. Aside from the mechanical breakdowns I mentioned earlier, the only truly negative aspects I experienced with the FRO trolling motors, is that they have an appetite for new saltwater fly lines and offer another obstacle to get tangled up with, requiring the caster to take extra care when managing their line on the deck. It will be interesting to witness the long term and cumulative effect of the increase in use of FRO trolling motors, because in the short term it would seem to allow fishermen to access more strings, have more shots, and catch more tarpon if used correctly. Consider if an individual boat was in the past able to intercept 2 out of 5 strings headed down the beach with a pole, and that ratio increases to be more like 4 out of 5 strings with a FRO trolling motor, that would seem like a total win, but if everyone down the line along the beach is able to do the same, resulting in more pressured fish swimming faster and deeper in the water, then was the gain really worth it for the overall fishery. Alternatively, I noticed with the added ease of mobility the FRO trolling motor affords, it opened up some areas that have more variability in tarpon travel lanes, which could spread out the fishing pressure and reduce conflict. It seems that the scope and depth to which this new technology influences this fishery, is ultimately dependent on whether people behave in a way that respects the fish, other fishermen, and the fishery as a whole. If aggressively operated an FRO trolling motor can access/impact more fish so it stands to reason that it can have a greater impact on the overall fishery than other methods of fishing. As with most fishing, it seems that showing a little restraint might go along way, to minimizing negative impacts rather than always going for that one last marginal shot at a pour angle and blowing them up, thus accelerating and exacerbating the adverse conditioning of the tarpon. 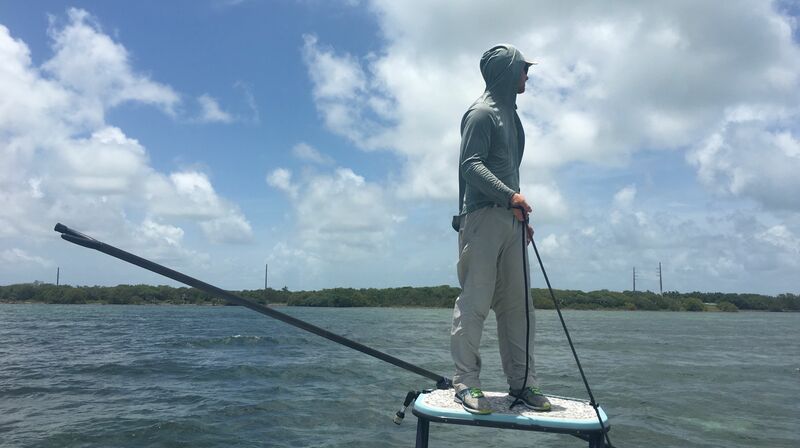 Seeing a person standing on the poling platform with a push pole in one hand and a FRO trolling motor remote in the other has become a regular sight in the Florida tarpon waters. The idea of this approach is that the macro moves are made with the trolling motor, or virtual anchor can be quickly switched to push poling for the micro adjustments. This switch of methods when the boat is closer to the fish can be useful for several reasons: if the fish are skittish that day, if the trolling motor will put them off, or to enhance the experience approaching in the more traditional manner. Even if the person atop the poling platform does not plan on using the push pole it offers stability minimizing the likelihood of falling off and getting injured. I don’t think that the push pole will ever completely be removed from the tarpon equation, forcing the poling platform to be renamed the spotting and maneuvering platform. However, you have to wonder where this technological innovation will take us…will trolling motors of the future merge tarpon hunting features and voice activation, integrating side scanning sonar with an AI interface like the amazon Echo? Will the fishery need the creation of more trolling motor free zones? I’m neither for nor against FRO trolling motors but one thing is for certain…they will continue to change the fishery. It will be difficult to not follow suit in some fashion, like the jet boat craze on the rivers of North America in the last 10 years, or the peddle driven fishing from kayaks everywhere else. Next time I show up to be guided or fish with a friend, it won’t matter which methods we use, but how we use them to continue to support a high quality fishery. Some may choose to ignore the emergence of these fully remote operated trolling motors only to be blindsided as the technology matures, gains a larger audience, carves out more market share and threatens the status quo.